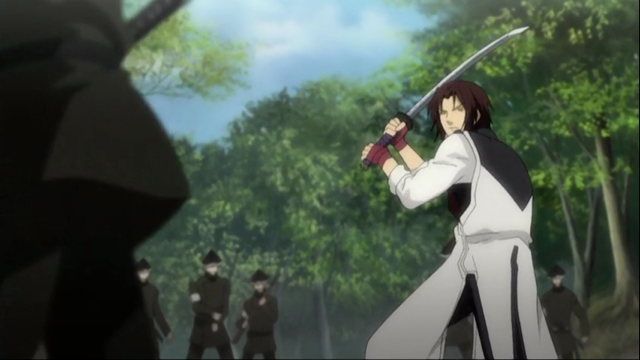 Hakuouki Hekketsu-Roku 14 is probably the best episode produced for the series yet (in either season). 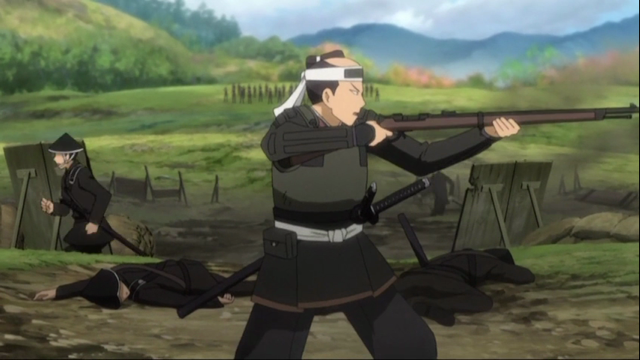 Essentially the situation for the pro-shogun forces, led by the Shinsengumi, is plunged into worse and worse situations right up until the final scene. There were several remarkable action sequences, some pathos, and even a shocking conclusion. 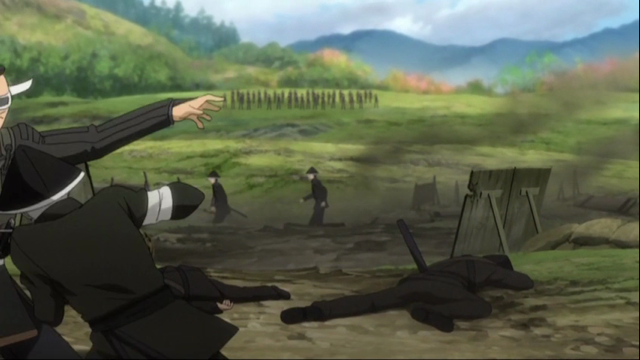 Since this episode was awesome, it includes an unusually large number of screen captures. 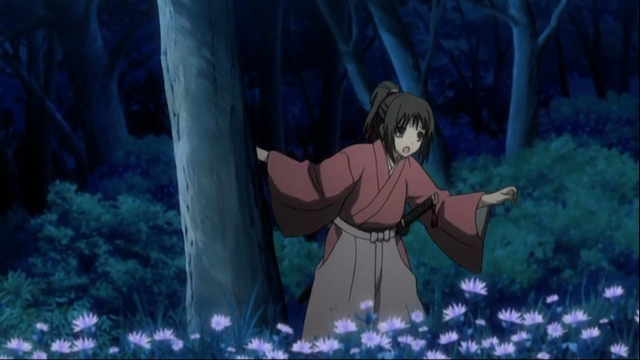 Chizuru with a drawn blade? Has she finally grown a spine? Things won't be this tranquil for long. 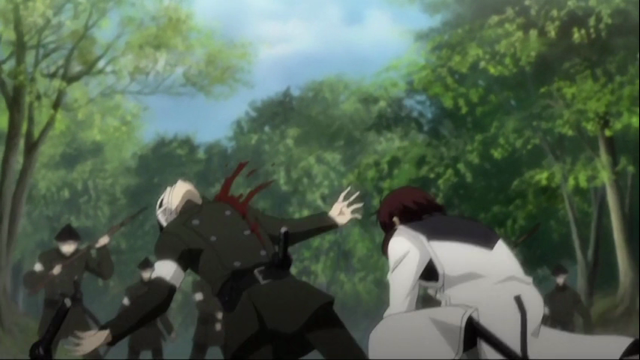 The march on Koufu Castle turns into a disaster. 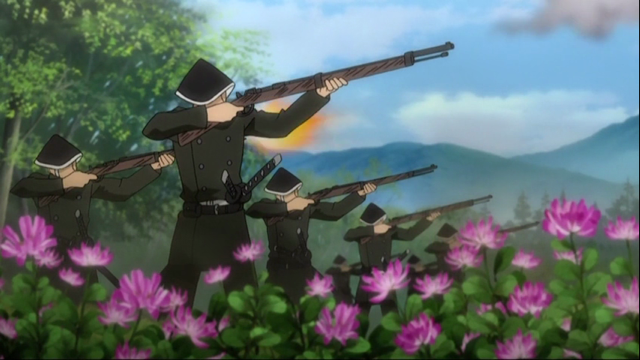 The newly formed Kouyou Chinbutai are already experiencing a lack of order in the ranks before they receive word that the castle has already been taken by the enemy. By morning many have deserted, and the situation looks hopeless. 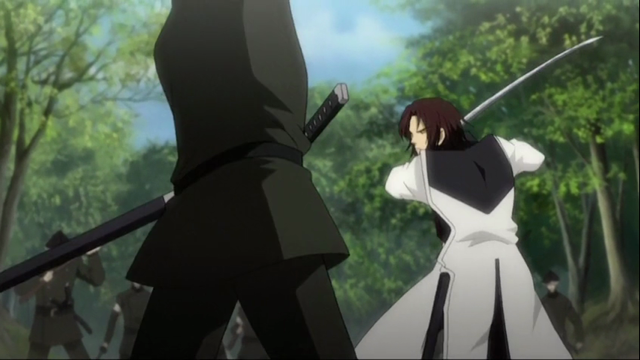 Chizuru and Hajime Saitou console each other on the eve of battle. 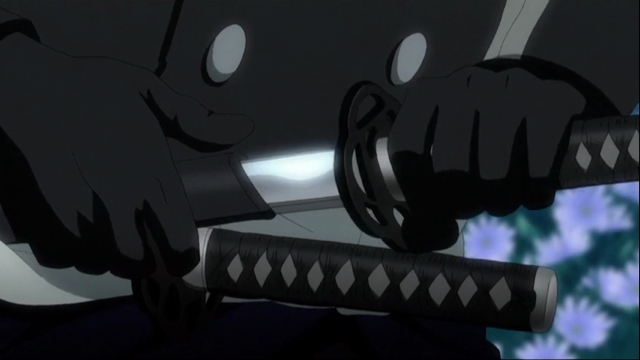 A real man speaks through his sword. 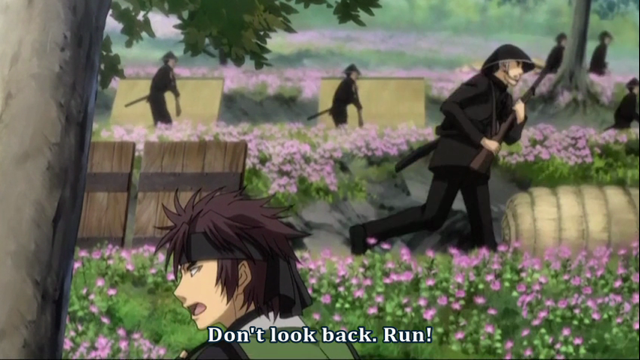 When Kondou joins his men, several urge him to retreat. 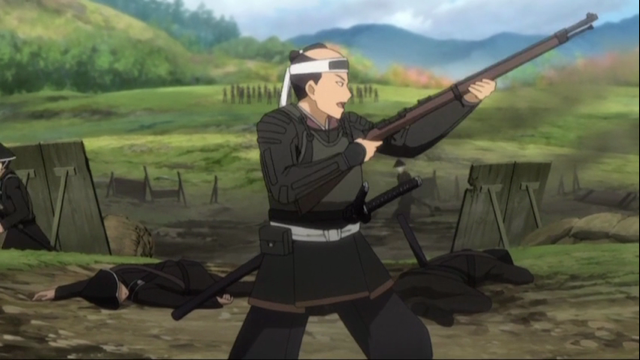 Hijikata leaves camp to get reinforcements. This is when I got the sense that something very bad was going to happen. 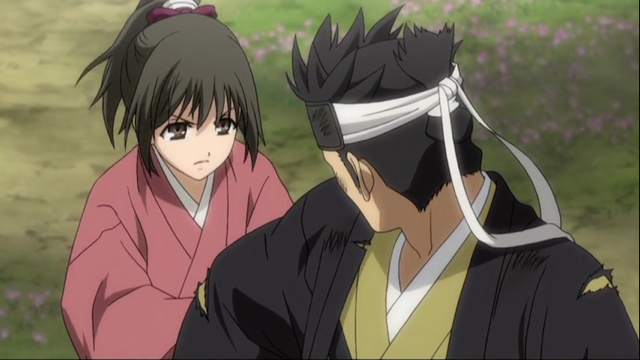 Chizuru swears to Hijikata that she will serve Kondou as his shield. WTF? 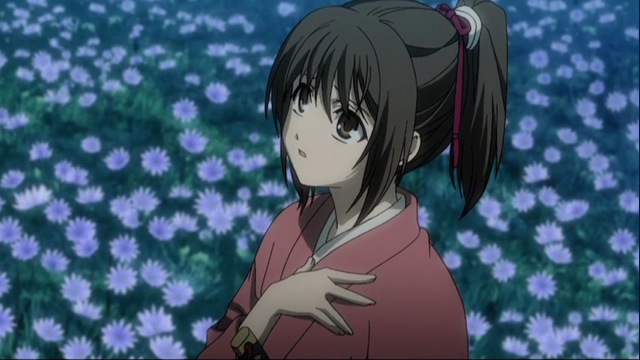 When the Shinsengumi depend on her for protection, they have to be hurting. 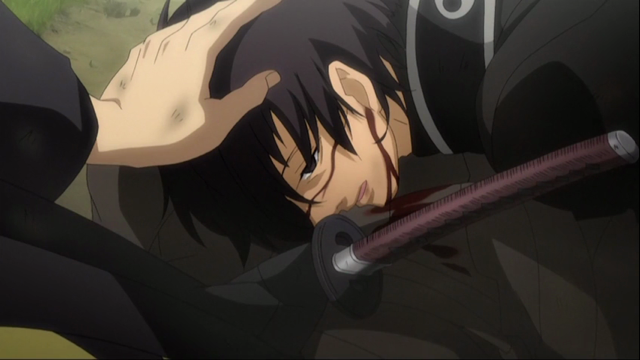 Fortunately Hijikata realizes that she is useless as a guard, and would only get herself killed. 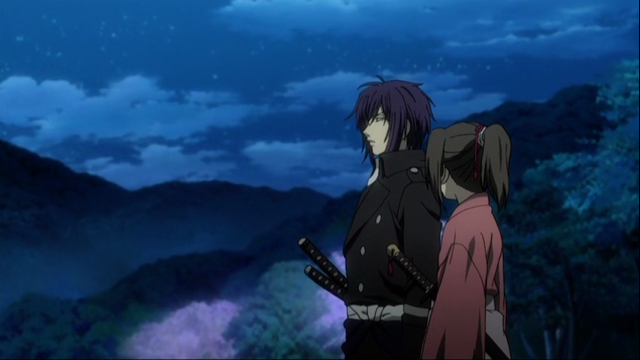 He tells her to keep herself and Kondou alive. 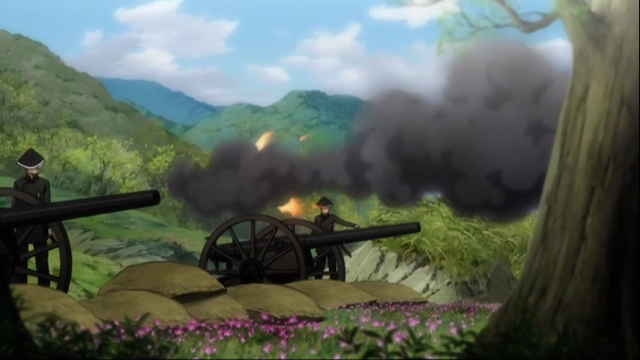 Within minutes the Kouyou Chinbutai frontline is overwhelmed by the superior firepower possessed by the opposing side’s troops. With more troops pressing from the sides, calls are made again to withdraw. 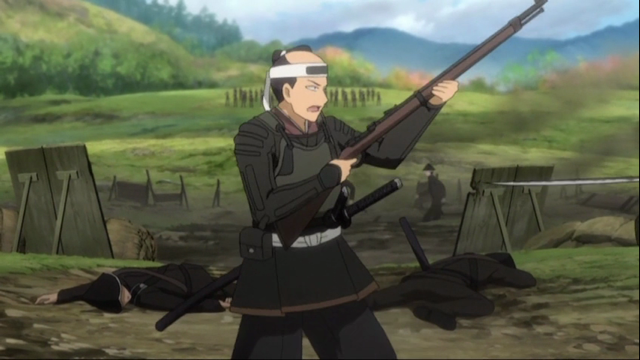 Kondou declares that he will personally lead the assault, and charges. (Yeah. :face palm:). 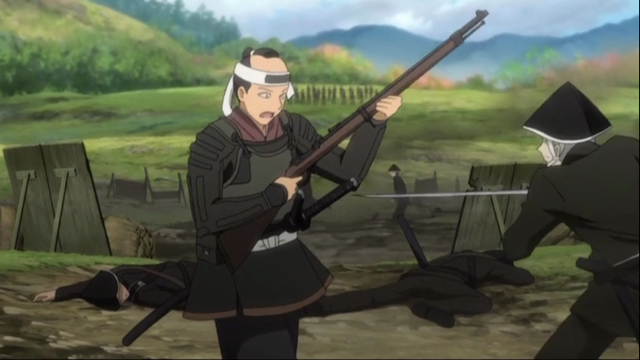 When Kondou sees the carnage of the modern battlefield, and realizes that their fighting spirit is meaningless in the face of heavy artillery fire, he despairs of his own role in the death that surrounds him. 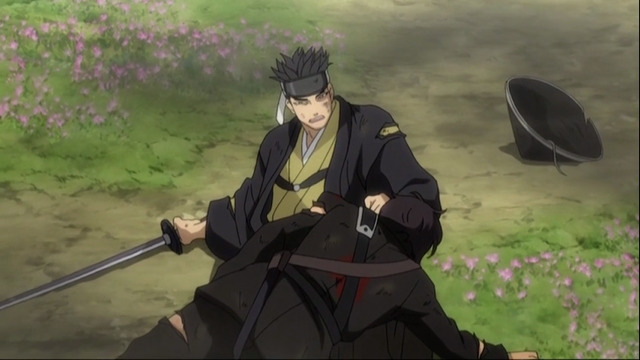 He gives the order to retreat, but, after everybody but Chizuru and Saitou had left, Kondou announces his decision to commit suicide here on the battlefield. 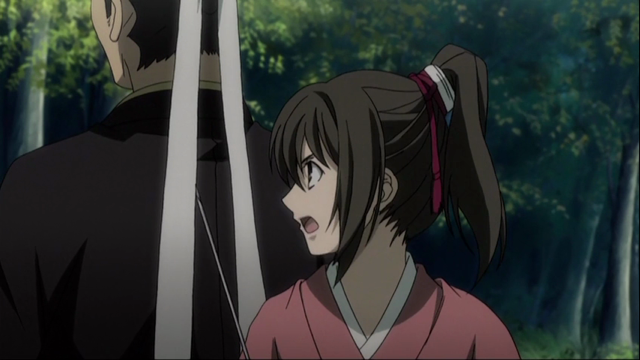 Chizuru refuses the order and demands that Kondou continue to live. She shows all the determination and courage here that I and others have wondered if she had in her. What is more, this is the kind of strength I can believe she possesses. 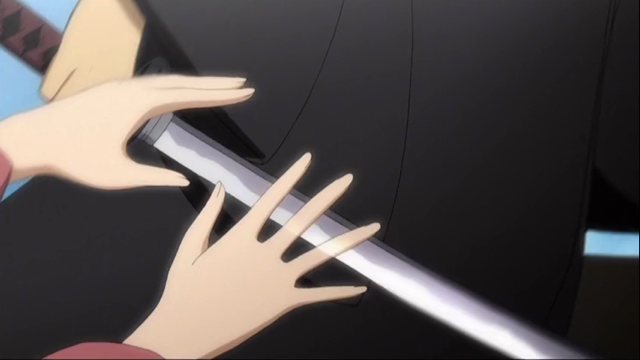 If she had suddenly used her sword to cut through a cannonball, I simply wouldn’t have believed it, but I do believe she saved Kondou’s life. Number three on list of things your commanding officer might say that indicate you aren't winning the battle. If everything that I already described happened in one episode, I would be pretty happy, because that’s about the amount of plot development we had been receiving in season one. 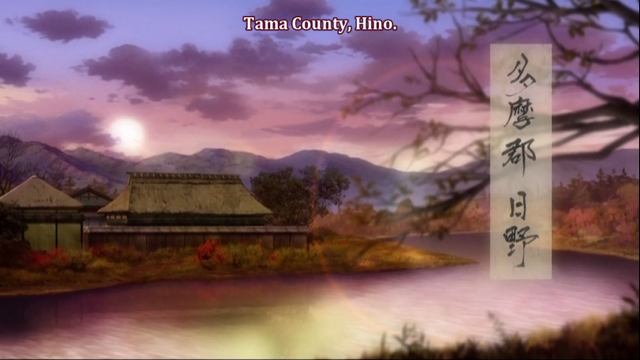 Impressively, this episode doesn’t stop there! 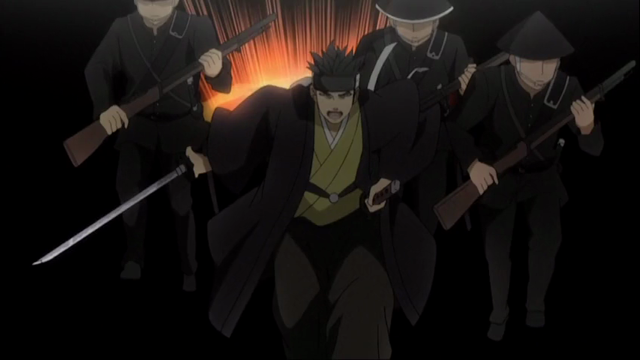 As the Shinsengumi attempt to retreat from battle, they are attacked by Rasetsu warriors — ones that can stand daylight! 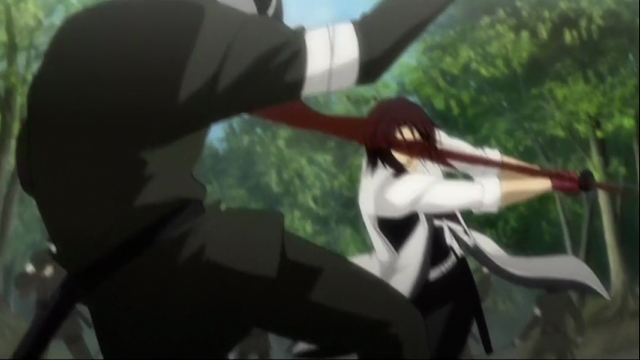 This results in some very nice action sequences. Ha ha! I got him! 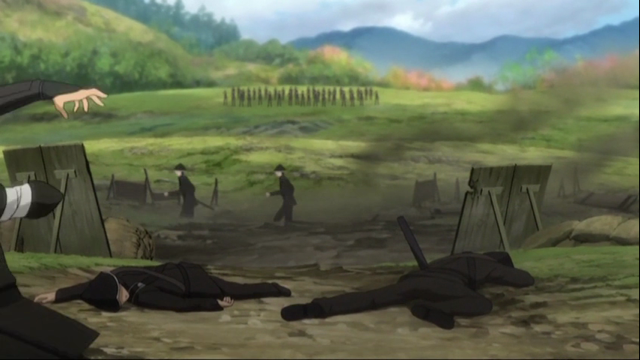 Needless to say, the members of the Shinsengumi fight bravely. 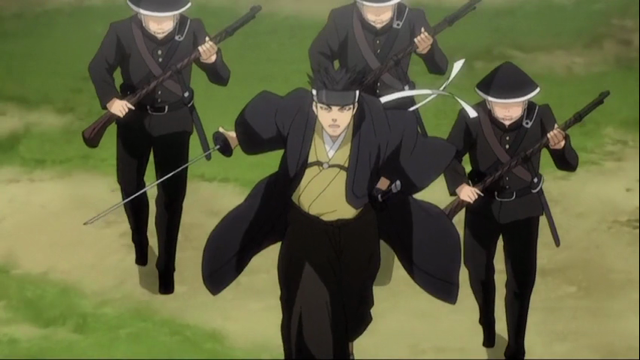 Here’s Sannosuke Harada fighting a horde of Rasetsu. 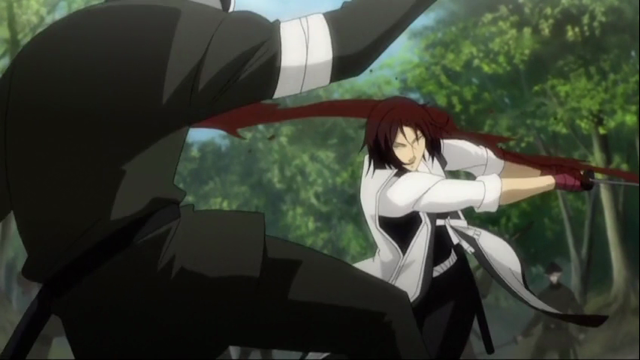 I love the way they connected his forms in one fluid sequence, capable of delivering multiple blows. 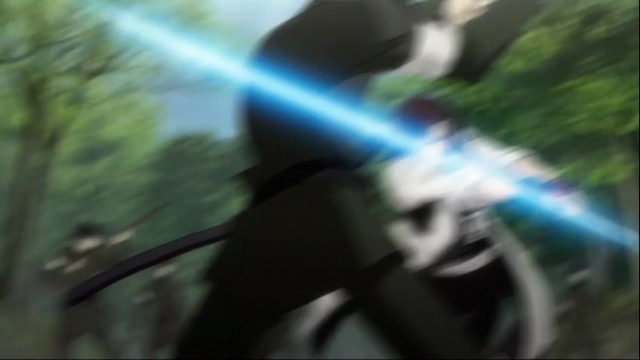 Really one of the finest sword fight sequences I have seen animated in a while. 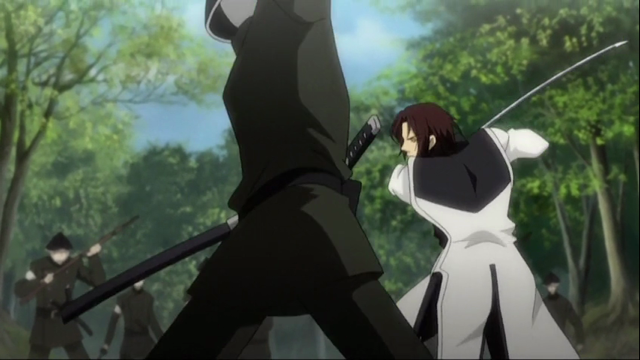 And to top it all off we have the arrival of the individual controlling the Rasetsu army. What an episode! 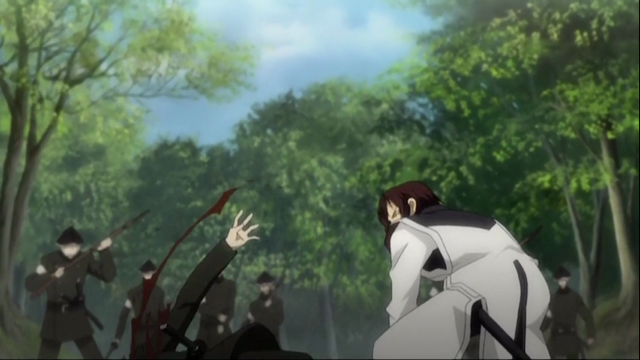 I loled at your action sequence. That was really in there. They had some great directing this episode. 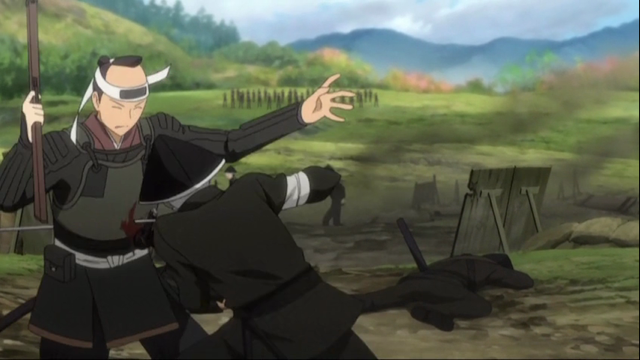 Studio DEEN has a lot to be proud of in this episode. Sorry, I meant what you wrote in it. You know, “I’m gonna kill you” part. Also, I have got to agree on that. 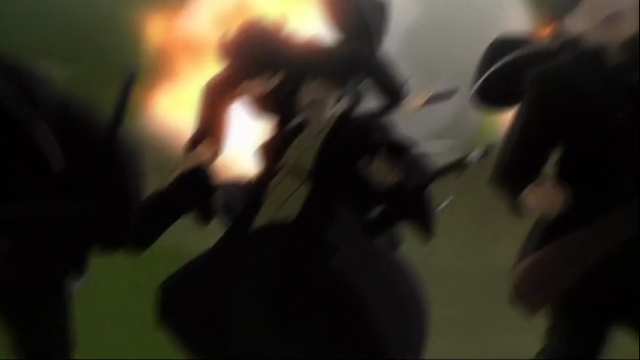 This is DEEN’s best animations. 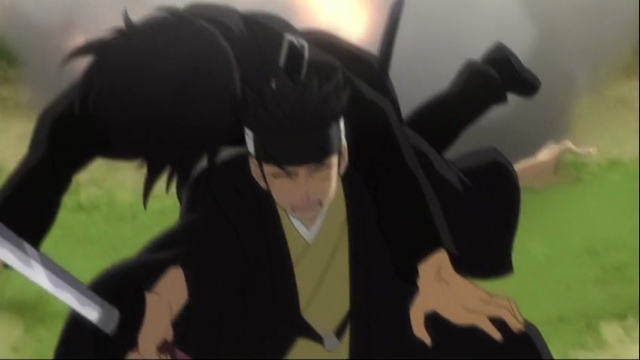 I also love the animation on 07-Ghost, also done by DEEN. I haven’t seen that one, yet. I’m really glad this season is turning out well, so far. 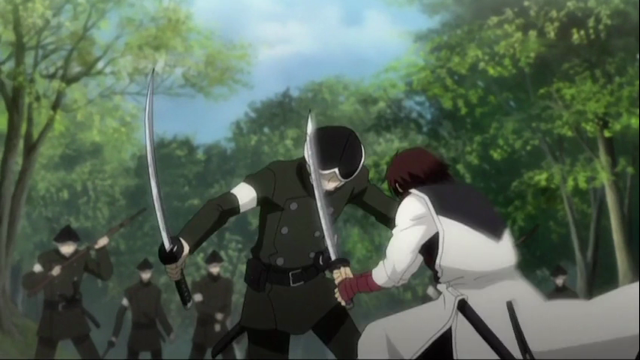 I enjoy the history, but sometimes the best thing is a well rendered sword fight. Please let them keep this up. I love it when dark-horse shows finish strong.